Hmm… we thought that we’ll run out of garden news eventually since our garden plants were greatly reduced due to health problems (i.e. John’s suffering from lumbar spondylosis that impairs his gardening activities). But it appears there are still leftovers that aren’t willing to be categorized as run-of-the-mill as yet. Some plants just want to be noticed and did their best to get our attention by putting up a show to amaze us! Last flowered more than 2 years ago. A year passed, then two and still no show at all. About a dozen new reed-like stems were added over the years and that was about all. Occasionally, the leaves were spotted with disease and had to be trimmed off or sprayed with pesticide, something we dislike doing as I’m allergic to pesticides. We had somewhat given up hope that it’ll ever flower again, threw in the towel and thought of disposing it. Could it have heard our rumblings and decided to reward us? To our utter surprise, a long flowering spike finally emerged early last month! We were extremely excited, very sure that we’ll be enjoying its lovely blooming presence in our garden for at least two whole months. Observing the yellowish-orange flowers closely, you’ll notice that its formation somewhat resembles the Cross of Lord Jesus, with an upright column and topped with three lobes. 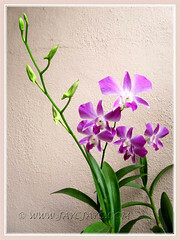 Hence, the Epi orchids are commonly known as Crucifix Orchid, besides other names, such as Reed-stem Epidendrum, Sun or Star Orchid and Poor Man’s Orchid. 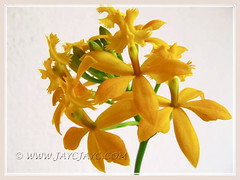 Know more about these interesting Epidendrum orchids that are native to the Caribbean, Argentina in South America and northwards to Central American, Mexico and South Carolina. Among all the species of orchids that we’ve grown thus far, Dendrobium phalaenopsis is the most reliable and hardy of the lot. 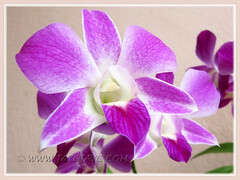 We’ve been growing this particular purple Dendrobium orchid from time immemorial! It certainly thrives very well in our garden, cared more by our tropical rain and sunshine. We’ve included them here as we’re extremely pleased with their performance. For the whole month of August, they have presented us with four flowering stalks altogether, with the last two, emerging with buds just during the final week. Yay, we’ll get to enjoy them for an extended period of another couple of months. How lovely! 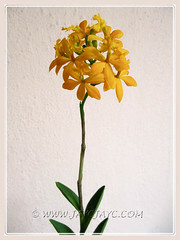 Dendrobium orchid (phalaenopsis type) is native to South East Asia and Australia. Read more about this orchid species here. As the blooms of our blue Mophead Hydrangea aged, they have often times faded gradually to a lighter blue and sometimes flushed green, pink and/or purple. It’s fascinating to observe the colour-change. However, this time around, we were more astounded as two of the lovely brilliant blue flower bunches that started off early July, not only did the usual colour changing act, but turned almost entirely to a darker pink and remained as fresh even after one and a half months! Even the green flowering stems that held them and the leaf petioles have followed suit to change, matching the colour of its flowers, as captured in the photos below. 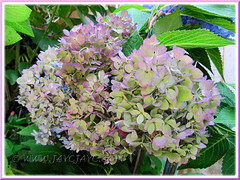 August 13, 2011: our Mophead Hydrangea, gradually changing from vibrant blue to chartreuse, light pink and purple. How marvelous and captivating to see several different colours on a single shrub! Wonder what caused this recent dramatic change in colour? Could it have been the frequent and heavy rains or the cooler weather as the whole month of August had been an exceptionally wet month this year? 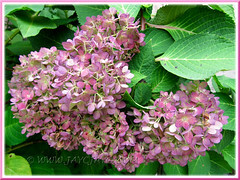 Hehe, we no longer need to seek out a pink-coloured Hydrangea, eh! Comes free with our Blue Hydrangea! It’s really wonderful to be able to enjoy such wonders in our frontyard! Praise and thank God! The best is always kept to the last, right? Last-mentioned but definitely not the least is our Passiflora edulis, the most outstanding and remarkable of the lot. Voted as the star of our garden show for the month of August, this lovely vine that was propagated in August 2009, not only flowered for the first time in two years, but bore 3 blooms, of which, one has set a fruit, now the size of a golf ball! How very exciting! The gorgeous white flowers are about 6.3 cm across, each with 10 white tepals and a large corona that is fringed with white-tipped filaments and purple to deep red towards the center. Flowers will open for a day and close the next morning. We almost missed its one-day flowering show. John, my better half, is usually more focused on completing his garden chores than admiring the plants he’s tending, unlike me who’s easily enraptured with the beauty around and admire/observe them closely. Thank God that I strolled into our garden for a breather one morning after a few days absence and noticed that 2 of its blooms had closed, with a third soon to blossom. Henceforth, I monitored the third bud on an 8-feet high stem like a hawk and was most delighted when it flowered 2 days later, enabling me to capture numerous photos of its lovely display! Strange that the vine is so straggly, devoid of leaves except for the last 1 m long terminal stem, and yet able to bear flowers and a fruit! We had almost wanted to get rid of of this Purple Passionfruit vine because of its somewhat ugly appearance earlier. Haha, it pays to be patient, eh! Now, we’re truly keeping our fingers crossed that the unripened fruit will grow steadily and ripen to amaze us further. So happy to disclose that another gorgeous flower had emerged two days ago… hope this will also develop into a fruit successfully. 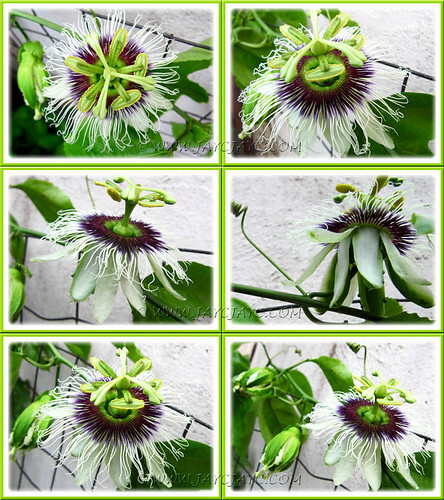 Do enjoy a collage of Passiflora edulis lovely presence at our frontyard. Don’t you think the top-right photo shows its happy and smiling face? Haha… as happy as both of us! I just couldn’t resist snapping as many photos to savour its beauty, as well as to share them here. Hmm… never can guess whether they’ll be another flowering/fruiting season again! Sorry you haven’t been doing well and hope you are well now. The orchid photos are lovely. 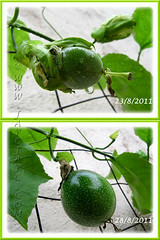 Here the passion fruit vine dies after two years with a woody passion fruit virus, and the initial part of the vine looks dead and woody but it still produces from the new shoots. The Purple Passionfruit flower has a nice nutty smell – reminds me of the black skinned “Kua-chi” that is used in mooncakes . 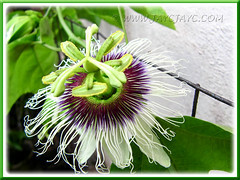 My passion fruit plant bears many flowers around this time, but on and off it will bear flowers. Not all flowers will convert to fruits too…..(sigh). The fruit will gradually turns reddish – about 3 months approximate the fruit will drop and be edible. 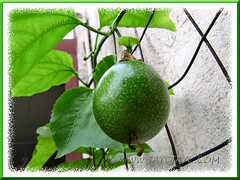 I am as fascinated with my passion fruit vine, but unlike yours mine has many leaves ! @ Africanaussie – Thanks for your visit and kind comments. We’re also hoping that our vine will continue flowering from the new healthy branches. Sorry that I’ve neglected to indicate that John’s suffering from lumbar spondylosis that impairs his gardening activities, hence the drastic reduction of our plants ‘cos I need his muscles, so to speak. Anyway, he asked me to thank you for your kind thoughts. 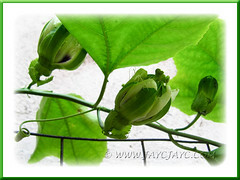 @ Sun-Ni-Mi-Gardener – How I do envy you for being able to produce such a healthy vine with many flowers, heh heh! I suppose your plant must be ground-planted, right? Ours is in a 15-inch terracotta pot, so probably restricted in growth and proper culture. 3 months is a long wait for the fruit to ripen… hope the monkeys don’t get it before us. My orchids has not flowered at all this year. 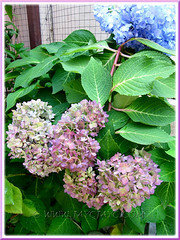 Your hydrangea colour change – can it be due to soil ph? 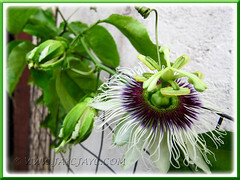 I am trying to grow some passion flower from seeds of store bought passion fruit. I wonder how it goes. Hope John is getting better now. Hope your orchids smile for you soonesti A. Belle! They can be so temperamental, especially the Cattleyas… ours hasn’t bloom for donkey years, so to speak. Re hydrangea, we’ve ruled out soil ph as a couple of other blooms from the same shrub just faded naturally to a lighter blue without pomp and splendour. Thank you for asking about John. His kind of problem needs a miraculous healing. We just pray and hope that it does not worsen to require an op.